Thank you for all your comments, questions and encouragement! I just wanted to let you all know that I am so excited to have received all your emails with comments, questions and encouragement. My heart also goes out to those of you that are struggling through these tough economic times. Due to the large number of emails I have received, it is unfortunately taking longer to respond to each of you than I would like. Please be patient as I work through the backlog of inquiries! We are receiving some of the same questions from multiple people, and will be posting some of these questions and answers to the blog over the coming weeks, as I am sure it will benefit many others in our community. Again, thank you for your support and patience! I am so excited to be re-energizing this great community! Previous post: What Would Your Life be Like if You Had a Bigger Piece of the More than $3.3 Billion Quilting Market? 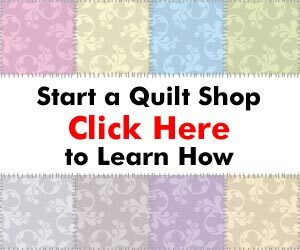 Next post: Welcome to the Quilting Business Blog!